In the cutscene, Where The Heart Goes, Terra-Xehanort (it's really Apprenticenort by this point but with one major difference) still has yellow eyes as opposed to the following cutscene Blank Points in which we see Apprenticenort with brown eyes. A massive part of me leaves this down to a tiny production error, but another part of me thinks this could add credence to the theory (initially suggested by Braig) that Xehanort was faking the memory loss. It's worth noting that he obviously recognizes himself as Xehanort at this point, and it could have simply seen a subtle way of showing that Xehanort was definitely in control still. Also, on the subject of eye colour, I notice Dilan's are a shade of purple, which is noticeably closer to blue (the colour of most of our OC protagonists eyes) than to shades of yellow and orange (the colour of our antagonists eyes, and DiZ/AnsemTW's). Eye's and their colours are incredibly symbolic in the KH series, I just wanted to see what people made of the creators decision to give Dilan/Xaldin this eye colour. He's definitely on the more sinister side of the organisation and it's worth noting again that he was in an "unstable" condition when he reformed in Radiant Garden, but at the same time there was never any real indication that he was in on Xemnas's true plans. Again, what do you guys think of this? The transition between Terranort and AX I always found kind of weird. I have to examine their models better later, but they always looked slightly different to me. Aside from the eyes, the hair also a little differrent. I guess it can be argued that AX just combes his hair differently, but I think his hair is less silvery as well? It is interesting to note though, but I don't know what to make of it. The thing with Dilan's blue/purple eyes is obvious. He's Kairi's father. It explains why Kairi was allowed to scamper around the castle and why her grandmother goes there to look for her. All joiking aside, Dilan's another weird one, but personally I don't give much thought to his eye color. Green seems to be more of the color of neutrality. I always thought that was weird why Apprenticenort's eyes are brown when they were yellow when Ansem found him. I'm currently chalking it up as his body settling down after all that happened caused the small change in his appearance. Actually now that you've brought that up it could add even more to the idea that Xehanort didn't really lose his memories. Take note of Young Xehanorts hair style then Apprenticenorts, very similar don't you think? which is weird because they are two separate bodies that are inhabited by the same heart (at different times of course). 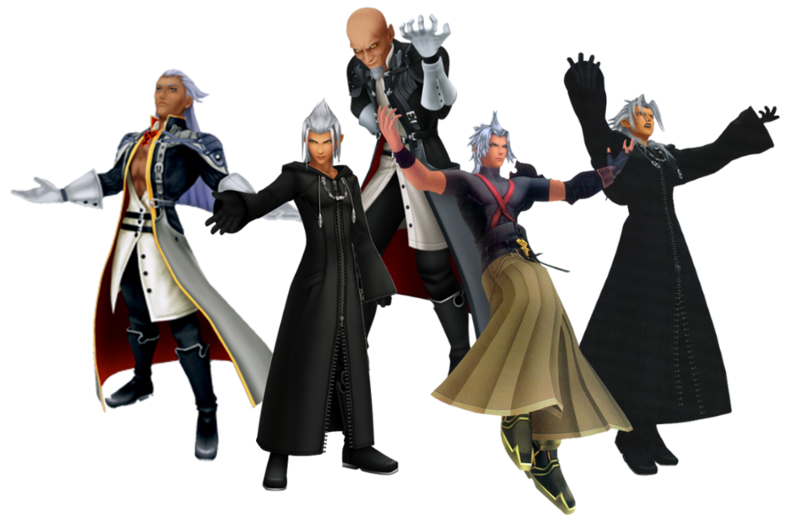 Xehanort's choice to style his hair like his former and younger incarnation could give credence to the idea that he remembers who he was. I've read a few theories on the green eye colour being sort of a neutral thing actually that's why I find it weird that his would be a shade of purple. I think its safe to say its likely/possible he never truly forgot. Nomura didn't seem to correct anything, though of course he didn't deny either, but I it's safe to assume he never forgot anything or if he did it was only shortly perhaps as some sort of disorientation after the Aqua battle. As for Xaldin I find it likely he's a xehanort in kh3. He was the most outspoken of the faults of the heart.